Discussion in 'Downhill & Freeride' started by ReVolVeRage, Jan 24, 2008. Whoa! Just went to go check their website (http://www.sicusa.com/) and this message appeared. It sure looks like the boys SIC have been hard at work in Frederick! 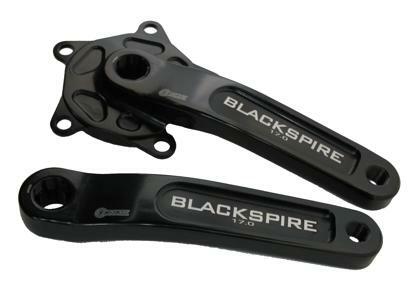 These definitely aren't cookie cutter cranks, thats for sure! Kind of reminds me of Saints, I dig em'! Hopefully, SIC is making a comeback after being low-key there for a while, they're an awesome company. I'm curious to hear peoples thoughts! i'm not sure i see the point of having a crank arm as wide as a loaf of bread, but the cnc work looks pretty good. i hope they come back, their stuff was simple yet very nice looking. My ankles hurt just looking at those. probably needs to be that wide to be stiff. since it isn't a hollow crank, they need to find a way to make it stiffer than it would be if it was a single solid rod of metal. to do that they need to expand the front/rear dimension so it doesn't flex under pedaling. they need to make the left/right dimension wide too so it doesn't have lateral flex either. the result = the I-Beam shape it appears to have. It's a marvel of how to set up a CNC machine to make art for sure. I would just wonder, since it it appears to have been carved out of an unmanipulated block of billet, if it's up to the strength of something that has been cold-forged, grain-aligned and manipulated for the purpose. keep wondering, as they have made not claims yet. In all seriousness though, I'm sure the SIC guys have taken this into account. 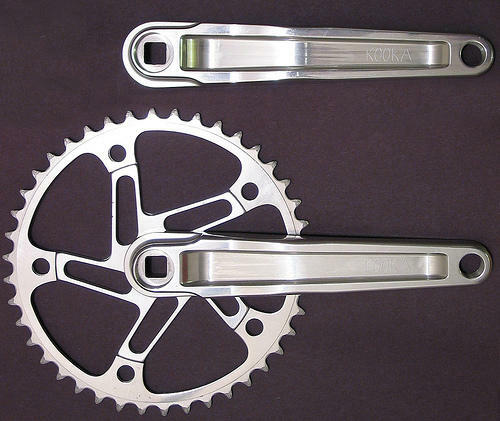 The cranks definitely look like no other - some very cool CNC work on there. It'll be interesting to see what the specs are. 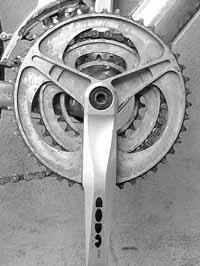 ...say... didn't the B1/Petespeed gearbox bike have some super-wide looking cranks on it??? I used to have a pair of these until they snapped. These cranks have been in the works since '04. Good to see them coming up for production. Great group of guys, its good to see it all coming together for them. I saw the FEA modeling on these things this summer. Strongest fully machined crank out there. Which isn't necessarily something to sniff at. Think about the costs of forgings. I just did, and now I have to poop. i wanted a set of these since i first saw them in 04, and have traded multiple emails with the guy over there since then about when i could get my self a set, and kept getting the answer.... soon... thank god they are back and maybe i will finally get my hands on a couple sets! I checked out the proto last year, they're not my cup of tea design wise (I like it simple) but count on it being a reliable product. As for weight it wasn't earth shattering light nor universe binding heavy. Is SIC still around their cranks looked great. Their web site is not working and I wondering if they went the dangerboy route and are no longer around.